Rollerblade® started in the 1980s. Introducing inline skating to people is in our DNA. We did then, and always will, make authentic products for a true skating experience. Now we would like you to meet some of the best people in the industry. 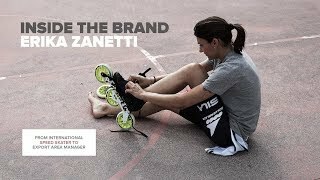 We proudly introduce: Erika Zanetti. Q. Erika you are a former World Champion. Please tell us how you reached this title? A. I started skating when I was 8 years old because my older cousins were skating too. I’ve been always a good skater, but not the best one; until I was 16 years old. That is when I won my first Italian, my first European, and my first World Title in the Junior category. Q. The love and passion for the skating is something you pass on now. How do you do that in your job as Export Area Manager? A. For sure people will see how much effort and passion I put in on a daily basis. I hope it will be “contagious” to clients and people that I meet. Q. What countries or areas are growing at the moment? Why is that you think? A. Skating in general is having a come back, partly because of the 80’s and 90’s wave that you see in fashion. Plus the general idea of being more green and avoid pollution problems, more and more people and countries are choosing alternatives way to go to work, or moving in the city. And skating would be the perfect option to improve a sustainable urban mobility. Q. In the video you mention the best memory is from the World Championship title you have won in Italy. You had to work your way up to the first spot and fight for the win. Do you still have the same drive at Rollerblade® now? A. Yes of course. When I feel like giving up, I always think about the hard training I used to do, or the hard challenges I had to deal with. It helps me a lot. Q. This year we’ll see you at the Berlin Marathon again. It’s for fun, but are you going for a time to beat, or maybe challenge some friends? A. It’s going to be my 5th Berlin Marathon. I always enjoyed that event and it’s crazy how many skaters are participating, the mood is always super uplifting ! This year, I want to enjoy as much as possible and challenges are accepted! Thanks for sharing your love and passion for the sport and the brand. See you in Berlin!